The Aspirants of the Obafemi Awolowo University(UTME) have been billed to commence the 2018 POST UTME Screening Exercise tomorrow,September 1,2018. As stated by the university management the examination will span through September 1-7,2018. The Examination will be computer based and will hold at the ICT Centre of the university. It will be recalled as last year , 40questions were given to the candidates with 10 questions per subject. All aspirants have been advised to take along their POST UTME slip & should be at the centre 30minutes to their allocated time. The Direct Entry Students should note that the screening process continues toll 20th September,2018 & are not to partake in the CBT Screening exercise. The professional football team of the Obafemi Awolowo University, OAUgiants, beats the football team of University of Ibadan named UIpioneers three goals to nil. The match which happens to be the second leg took place at Obafemi Awolowo University's stadium known as Main Bowl after the first leg was played in University of University's stadium and both school teams departed with a draw with the score of 6 goals, three goals from each team. 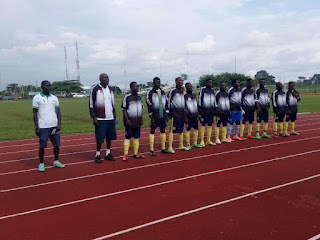 The match took place in the presence of Prof. Ogunbodede, the V.C of OAU, the Dean of the Division of students, Prof. Aransi and many other dignitaries from both learning institutions and the higher institutions football league organizer, sponsors and promoters. Presents "Operation blast 2018 ALL Schools POST UTME, OAU PRE-DEGREE & JUPEB" Are you ready to cross the last admission hurdle? Do you need intensive & superlative lectures to firmly position you for admission this year ? Are you worried about where to stay for the duration of the lectures? 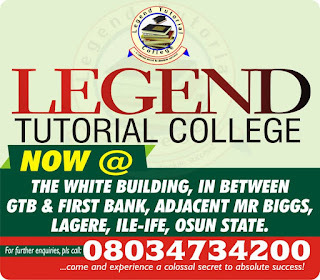 Do you also need Past POST UTME & PRE-DEGREE Questions & Answers of any institution of your choice? Decent Hostel/ Accommodation available for distant students. For further enquiries, please call: 08034734200. The Independent National Electoral Commission (INEC) in Osun State has released names of forty eight political parties that are contesting for the forthcoming governorship election slated for September 22, including names of governorship candidates and their running mates. The Resident Electoral Commissioner for the state, Mr Segun Agbaje, in his remarks during the presentation of soft copies of voters’ register to political parties, said the exercise was in line with the electoral act of the country and the law of the Commission. He added that a total of 1,152,751 PVCs have been collected by voters out of the 1,668,524 received in the state, leaving a balance of 515,773 as at August 17. According to him, the over 500,000 PVCs that are yet to be collected out of the over 1.6 million produced for registered voters is becoming a thing of worry to the commission. It was a pathetic event Yesterday. One of the students in my faculty suddenly collapsed and became unconscious. The school health centre had to refer us to the Accident & Emergency Unit of OAUTHC, Ile-Ife. I joined four other student executives in the ambulance as we sped of. Barely, few minutes to the Emergency Unit, there was a huge traffic on the road. Incredibly, it was presumably a funeral party hosted by one high political chieftain in the community. Cars blocked the one-lane road on all sides. Even with the whirring of the siren, we spent over 20 minutes before we found a way amidst the heavy traffic. I wondered, how on earth would the hospital roads be blocked because of a party. I marveled. We had no option but to come down from the ambulance to ward the traffic.